Quaze is a simple quiz app which help user to become Quiz Master. Quaze app has two levels of questions and each level has 12 questions in MCQ pattern. We have developed Quaze app with total ten topic and thousands of questions. This app is quick and easy to use. We have developed Android Quaze app and it is ready to develop from Google Play. User can select level of quiz. Use can take quiz and answer questions by choosing their answers. User can access all topics. 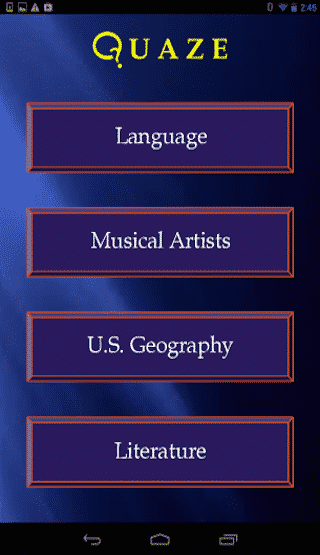 App is implemented with local database and answered quiz can be saved into the database. App has animation for falling questions and answers block. Client wanted to create an app with several topics and thousands of questions in a well specified manner where user can quickly handle number of quiz in a day to increase the learning power. We have built Quaze App with Topics, Sections, Quiz Levels and MCQ based questions to provide increased learning to users. Quaze App has features like Topics, Quizzes and Quiz Levels.